Preserve Original Sound allows you to preserve the sound from your microphone without using Zoom's echo cancellation and audio-enhancing features. This is ideal if your microphone or sound equipment has these features built-in and you do not need the additional enhancement. You will first need to enable the setting for yourself, a group of users, or your account in the Zoom web portal. After enabling it on the web portal, you need to check the option in your Zoom client to display Turn On Original Sound in the meeting. Once enabled in the client, you can turn this setting on and off in your meetings as needed. Sign in to the Zoom web portal as an administrator with the privilege to edit Account settings, and click Account Settings. Navigate to the Allow users to select original sound in their client settings option on the Meeting tab and verify that the setting is enabled. Sign in to the Zoom web portal as an administrator with the privilege to edit User groups, and click Group Management. 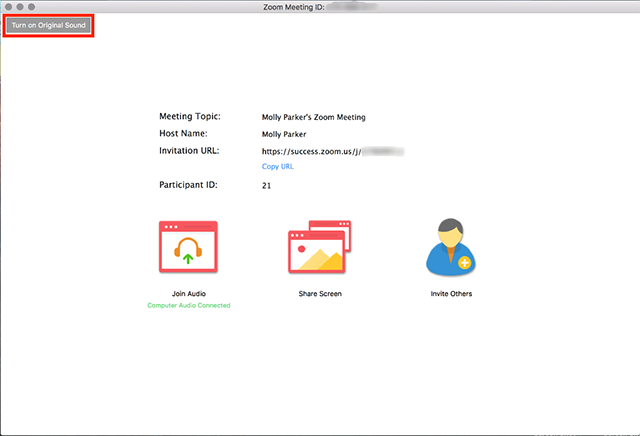 Sign in to the Zoom web portal and click My Meeting Settings (if you are an account administrator) or Meeting Settings (if you are an account member). After logging out of the Zoom client and logging in again, the users you enabled the setting for will now be able to turn on the option to see Turn On Original Sound in meetings. They will need to do this in their Zoom client settings. In the Zoom client, click on Settings. 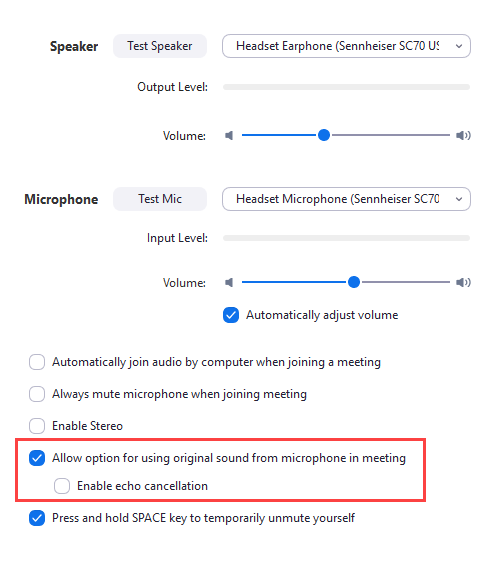 Check Allow option for using original sound from microphone in meeting. Once in a meeting, the option to turn on Original Sound will now appear in the top left corner of your Zoom window. Click this button to use Original Sound in this meeting.